The Roomba robot vacuum has made cleaning floors easier than ever before. Since 2002, the Roomba got more powerful, sturdier and even learned to map out a room while cleaning it up. Now, the new Roomba i7+ can also empty the contents itself into its Clean Base dustbin. 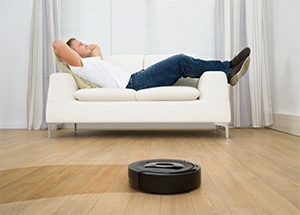 As the Roomba i7+ vacuums, you can sit back and relax without any worries about cleaning your floors yourself. While this gadget is remarkable, there are some things to consider before purchasing it. The Roomba i7+ is designed to empty itself after everything cleaning. To do this, it needs to use the Clean Base, which doubles as a charging station. With previous Roomba models, the charger was flimsy plastic, but the Clean Base is much sturdier. The new base takes up more space than its previous versions. Since it is 19 inches high and 15 inches deep, you will want to make sure you have space for it. Once the i7+ is on the base, it will charge up and start cleaning when it is ready to go. To have the Roomba start cleaning, you can press the large Clean button on the top, use the mobile app, or tell Amazon’s Alexa or Google Assistant to make it start cleaning. Are you wondering how this Roomba empties itself? It’s all about the Clean Base, which connects to an opening under the Roomba’s dust tray and then empties the contents. The Base can hold up to 30 bins of dirt before you have to do any emptying.